Dr. Kim Bridges | Appalachian Veterinary Services, Inc.
Dr. Kim Bridges was born in Franklin County Virginia and grew up on a small farm that included a menagerie of animals from a bobcat to horses,cattle, goats, and one donkey. She showed horses for several years throughout the South and Southeast and continues to enjoy the lifelong companionship of her trusted mounts. She attended Virginia Tech where she received a Bachelor of Science in Biochemistry and later her DVM at Virginia-Maryland Regional College of Veterinary Medicine in 2005. After graduation, she worked in a progressive 9-doctor predominately dairy practice in Lancaster County, Pennsylvania. 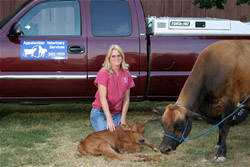 In Pennsylvania she and developed and led a milk quality assessment program which she has also instituted at Appalachian Veterinary Services. Dr. Bridges’ areas of interest and expertise include mastitis prevention, bovine reproduction, field surgery, pleasure horse and small ruminant medicine.